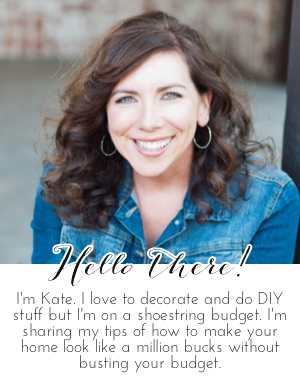 Chic on a Shoestring Decorating: Easter Eye Candy, No Calories! Easter Eye Candy, No Calories! I need to save my calories so I can pig out this weekend on Reese's Peanut Butter Eggs stolen from my boy's Easter baskets (why are they so much better than the regular cups?? am I the only one that thinks this??) So, I'm going to be indulging in some calorie free Easter eye candy while I eat a handful of pastel M&Ms. My kitchen table centerpiece... I threw this together last year and really loved it so decided to do it again this year. I love decorating with birds and nests and eggs, even when it's not Easter, is that weird?? 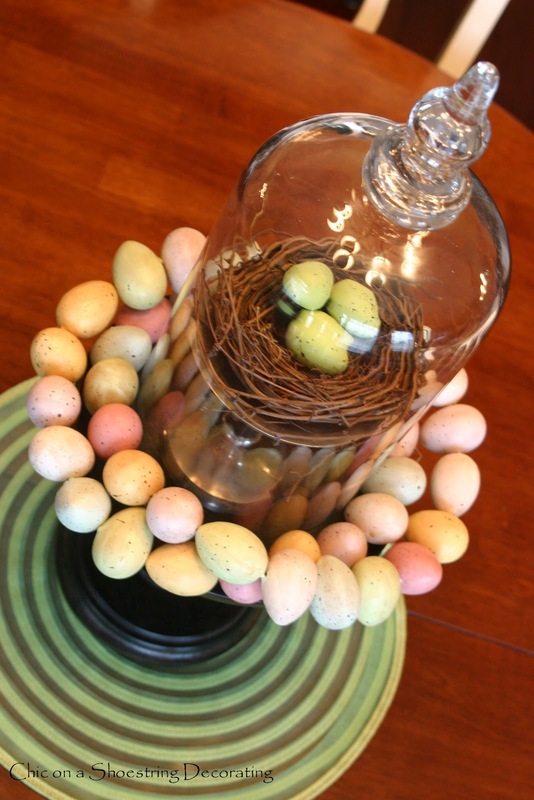 A new item this year is the egg wreath below. I scored it last year after Easter for 90% off, paid a whopping $3.... LOVE it! Birds on candleholders, it just makes sense. Click here to see how I made their floral nests. Click here to see how I arrange faux forsythia and pussywillow branches, it's pretty much fool proof. The other new addition to my spring decor (only 2 things this year!) is this lovely wooden tray on clearance at TJ Maxx for $3, yes $3, really. I love the tulips and daffodils from our yard... if they would only bloom all summer long. Hope you enjoyed my zero calorie eye candy. If not, go get yourself a Peep, I won't tell. It looks so good. I love your little birdies and bunnies. Lovely, lovely! So many cute and original ideas. It looks so fresh and springy! Sneak a chocolate egg for yourself, you deserve it after all that work! I really love the tray! Nice score! You inspire me. I luv the birds on the candlesticks! And the $3 wreath!! Everything is so pretty. Your spring ideas are so pretty and calming! The egg wreath was such a great find!! Love the beautiful flowers, too. Happy Easter!